Dad stopped wearing his hearing aids because “they drive me crazy.” Well, talking to him without hearing aids is driving me crazy. I have to repeat or yell every sentence, particularly in restaurants or stores. I say something and he answers with a totally different subject because he couldn’t hear me. Spending time with him is mental torture. Why is he so obstinate? 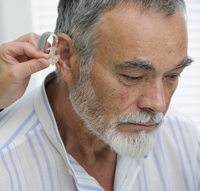 End your torture by asking yourself this question: If dad bought hearing aids because he wanted to hear better and they “drive him crazy” instead of helping him, why should he wear them? Ask him 1.) Are they uncomfortable? 2.) Do they produce whistling, static, or other sounds? 3.) Do they improve his hearing? Find the instructions, then ask dad to demonstrate how he cleans them, stores them at night, inserts or changes batteries, and most of all, how he turns them on! Ask him to try again, this time with your advocacy and a board certified audiologist whose tests will help determine which type of hearing aides will work best for him.